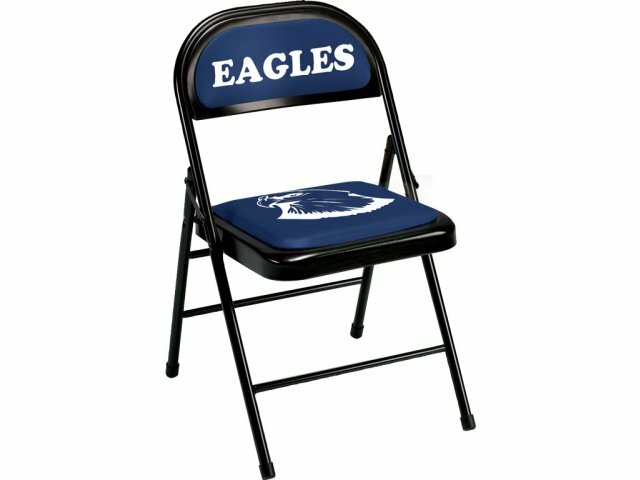 Here's the easiest way to get logo folding chairs with your school's team name. We have pre-selected the most common team names in the United States, such as: Trojans, Bulldogs, Cardinals and many others. We screen the team name on the chair backs and the image on the seats. 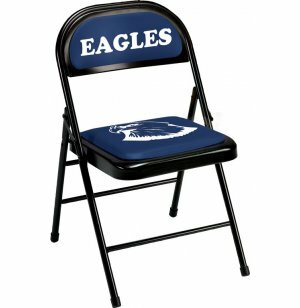 (If you don't find your school's team name, we can still make the chairs with the team name and image of your choice for an additional charge.) Just choose the team name and color and we will send these chairs to you right away. The seam-welded tubular steel frame and heavy-duty steel seat and backrest are designed to withstand years of heavy use. These folding chairs are made with a one-inch cushioned seat pad. Optional ganging devices allow you to connect these folding chairs in perfectly straight rows. These folding chairs can pay for themselves when offered for sale to alumni. Heavy-Duty Steel Seat & Backrest. 1" Foam Cushioned Seat Pad. Mascot Imprinted on Seat, Team Name Imprinted on Backrest. Font Style: Cooper Black in Capital Letters. Choose from our selection of common mascots and team names (there is an up-charge for other mascots or team names).